The Mystery Hidden in Lake Yasogami, episode 4 of Dimension W, shows us another way numbered coils can be scary. We also get hints that numbered coils mess with time. Want to read the paper back? You can buy Volume 1 from Amazon! At Albert Schumann and New Tesla Energy’s urging, Mary sends Kyōma Mabuchi and Mira Yurizaki to visit the supposedly haunted mansion where a mystery novelist, Shijuro Sakaki, drowned (in the middle of his study) at the end of last week’s episode. His personal robot recorded some of the event, but there’s a gap where the man actually dies. Mabuchi and Yurizaki were almost there when Yurizaki thought she saw a woman in a white dress standing in the middle of the road. When Mabuchi stops, there’s no one there, and there’s not even an image in Yurizaki’s memory logs. She’s shaken; he thinks she’s malfunctioning. Elizabeth tries to teach Mira a lesson in socially acceptable behavior. Capture from the Funimation stream. When they arrive, Mabuchi warns her to pretend to be a “normal” robot since there are other guests. Seijyun Makita, the hotel manager, introduces Mabuchi to Marisa Sakaki, the current owner, who’s frail and is the younger sister of the deceased. Mabuchi also meets a loud-mouthed, rude and demanding guest who’s a journalist named Atsushi Hageyama. He recognizes Mabuchi as a collector sent from New Tesla. Elizabeth Greenhough-Smith introduces herself, and Yurizaki is sure she’s seen the woman before. Three obviously shady character watch the scene from a nearby table. When Mabuchi opens the door to his room, he finds Albert waiting for him. Albert chides Mabuchi for prying into numbered coils, making Mabuchi so angry that he attacks Albert. We learn that both belonged to Grendel. Even when Mabuchi throws Albert out a third story window, Albert just lands on his feet and tells Mabuchi to meet him the next night for drinks. The scene switches to the unsavory characters in their hotel room, and one of whom says the fog’s starting to come in. We also see Elizabeth throw three flying objects out of her window as Marisa Sakaki stares out at the gathering fog, her face drawn in pain. The next morning, Mabuchi finishes reading some of the books that Albert left behind. He asks Yurizaki to scan the books in the local library, many of which are not available elsewhere. He hopes she’ll find a clue in those local books. Meanwhile, he drives around the local sites like the dam and a shrine to those who perished in an accident during construction of the house/hotel. He is trying to understand the event that years ago started the rumor of hauntings. Reading scary mysteries terrifies Mira. Capture from the Funimation stream. The mystery writer who died wrote many of the books Yurizaki tries to read, and they terrify her. Her father built her to construct a mental model or vision of whatever she read so she could thoroughly understand it. When reading something scary, that makes her feel anxious and jumpy. That night, the journalist runs through the fog, trying to escape the white-dressed woman Yurizaki saw earlier. He doesn’t survive the encounter. Mabuchi meets Albert for drinks. Our hero is angry because Albert didn’t tell him numbered coils were involved. Mabuchi had discovered that most of the victims of the accident were students who had brought a coil — a numbered coil — to the area. He also figured out that the numbered coil had never been retrieved. Albert confesses that Haruna Enamori borrowed coil 189 and activated it. Hers was the only body not recovered. He further confesses that others have drowned, too, trying to get to the bottom of the mystery. For the last ten years, there were no ghosts. Now, they’re back. Both suspect that the deceased writer knew something that they don’t about the numbered coil. Albert reveals he asked for Mabuchi to do this job because Mabuchi was the only survivor of a numbered coil accident in the past. Yurizaki finishes reading the books and tries to take a shower to clear her mind. The books struck her as too detailed and gruesome. Realizing that the books depict the area as it was before the dam was built, she reconstructs the original area in her mind. She slips and falls, not noticing that the fog’s rolling in. She realizes that somehow, she’s experiencing the past. She’s attacked by a woman who’s arm appears warped (perhaps by the numbered coil?). 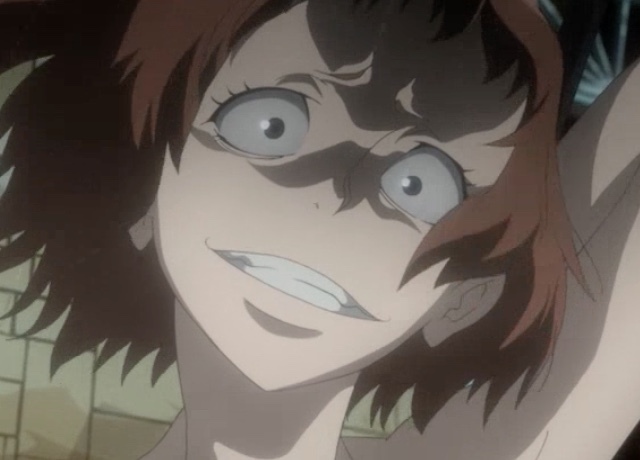 This crazed woman with a warped arm attacks Mira, who’s obviously having a bad day. Capture from the Funimation stream. Koorogi reports to Mabuchi and Albert that he’s reconstructed the robot’s memories. The restoration shows ghostly figures forcing water down the writer’s throat. Albert suspects the numbered coil sealed the tragedy and everything about it in Dimension W.
Yurizaki tries to escape, but whatever beings are in her memory’s trap capture her. About the same time, Makita announces that they’ve found Hageyama dead. Elizabeth is already at the scene, and Mabuchi realizes she’s a collector, too. The lights go off; Makita cannot contact the police. Mabuchi hears Yurizaki scream and he tries to reach her. The unsavory characters burst into Marisa Sakaki’s room and tell her they know her dreams are necessary to connect “to the other side.” They kidnap her until they can get the numbered coil. Mabuchi isn’t able to stop them because they have superior weaponry. Elizabeth sends some of her airborne surveillance robots after them. Yurizaki finds herself chained in a boat house. The woman who tried to kill her is on the arm of a man Yurizaki recognizes as the dead novelist. She doesn’t know how to interpret what she’s seeing. Yurizaki squeaked a lot in this episode. I hate to admit it, but it’s darned cute. I’ve said it before, and I’ll likely say it again. Mabuchi has some smooth dance moves. This is something I should absolutely not laugh at, but when Mabuchi calls Yurizaki “piece of junk,” she answers. And I laughed. She’s so cheerful it’s almost painful to see him speak roughly to her. Yurizaki tries so hard to act like a normal robot. I think she almost gave herself a nervous breakdown. Albert looked really sure of himself when he goaded Mabuchi into attacking him. I kinda liked his surprise when Mabuchi was able to land a few punches. As Yurizaki’s reading and recalling her father, the house settles and she squeaks again. Again, very adorable. When Mabuchi joins Albert for drinks, they talk like they’re old military buddies. It was a completely different vibe I got in other scenes. Maybe Albert’s not a villain? By the end of the episode, Mira’s in serious trouble. Trapped in the past? In her own mind? In Dimension W? Capture from the Funimation stream. Yurizaki, in the shower, recalls that in reading the deceased’s books, for the first time she connected smells and fear. Her eyes are dilating almost out of control. The books really seemed to upset her, and I thought the show did a great job dramatizing that. Did someone really need to steal Yurizaki’s clothes (or strand her in the past wearing nothing but a towel)? I’m all for fan-service when it makes sense, but setting Yurizaki up to be tortured in a towel pushes the boundaries for me. The ghostly woman in the white dress looked a lot like Shiki Magata. 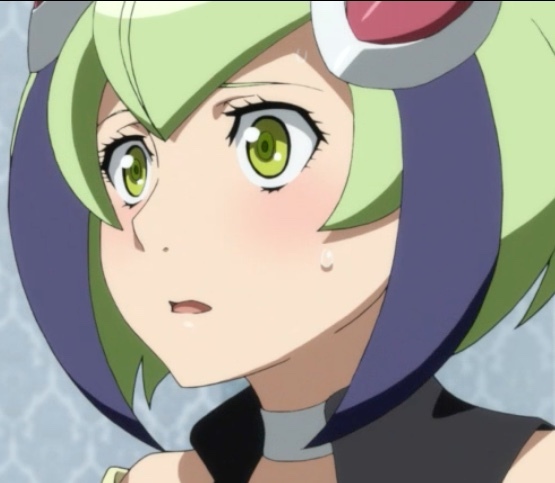 I knew she was a genius in The Perfect Insider, but showing up in Dimension W seems extreme! As the series progresses and I see Albert and Mabuchi interact, I begin to wonder if Albert and the COO we met in a previous episode are really villains. The COO seemed to be aware that Dimension W’s power presented a mortal danger to humanity, and she hoped they’d survive it. Albert seems callous, but perhaps he’s just ex-military. He and Mabuchi, when they’re not fighting, seem to get along well. Maybe Albert’s excuses about the previous management at New Tesla Energy killing the previous CEO’s wife and daughter were true? I enjoyed the horror tones in this episode. Often, a series will throw a scary episode in to spice things up, and those episodes often feel contrived. In this case, though, the fog and conditions of terror are another manifestation of a numbered coil, so those ideas contribute to the story. So did the horror overtones work for you?